I realized today that my kids didn’t get to see snow this winter. Some of you might be snowed in hoping for spring to come early, but here in San Diego we actually have to travel to play in snow! We usually drive the kids to Big Bear and stay a couple nights at a hotel but this year we skipped the weekend getaway. Some years it snows while we’re there and some years it doesn’t. Last year was super exciting because it snowed so much while we were there that we stayed an extra night for more snow play! So anyways, snow is a novelty where we live, and I have to think up ways for my kids to have winter fun even if the a/c is running. 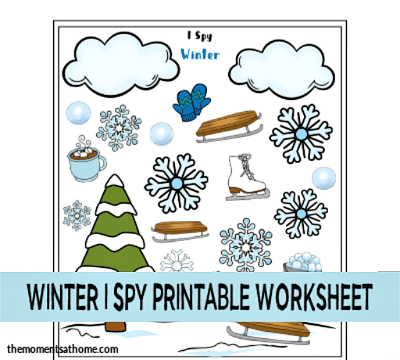 This month’s I spy activity is winter themed! Each month I’ll be sharing a new I spy printable worksheet that is free for the entire month. Read more about my I spy printable series here. Subscribers to my printable email blasts will have first access to these printable activities. Not a subscriber? Sign up here for early access and exclusive printable worksheets for kids. Screenshots don’t make good printables! For best results download the file to your computer and then open the saved file to print. Download the file by clicking the printable button below. The printable worksheet has a box towards the bottom of the page with pictures of objects that kids can find in the picture. Find snowflakes, snowballs, mittens and more! The I spy printables in this series are made for younger kids from about preschool to 3rd grade. If you’re looking for printables for older kids head over to my Tween Parenting website! Be sure to check back next month for a Valentine’s Day themed I spy printable.